Always Keep Clean ,Waterproof and Durable,Long life cycle,3-4 times than Canvas. 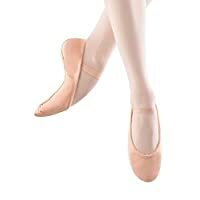 Split Sole allows for optimal flexibility and arch when in pointe. The unique split-sole ballet shoe features a lightweight, durable, soft leather upper. An elastic drawstring, and a cotton lining make this shoes comfortable, and great fitting. Hand-made ballet shoe made from supple and durable pigskin with cotton lining. Full Sole Perfect for beginners and children.These ballet shoes are hand lasted from soft graded leather. Breathable, soft, anti-slip and durable full sole leather ballet shoes . Lightweight Slippers To Let Your Feet Breath And Comfortable.Suitable For Spring, Summer, Autumn And Winter.All The Year Round. 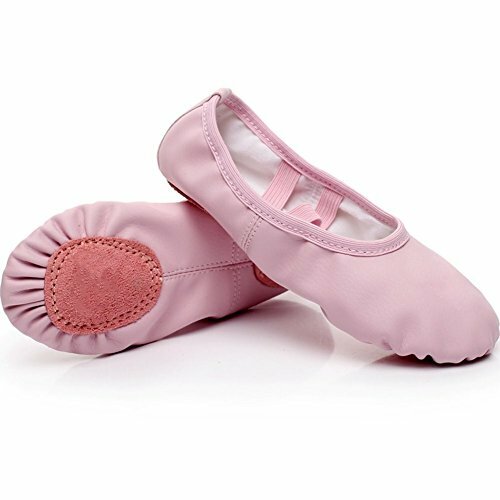 Thickening Lightweight Dance Sole, Better Support Each Of Your Movements, To Achieve A Stable Sense Of Balance, Avoid Hurt Feet For A Long Time. Foldable Ballet Flats Also Can Use To Be Dance Gymnastics Yoga Travel Shoes. Canvas fabric allows slippers to be washed to stay clean and free from odors. The unique split-sole ballet shoe features a lightweight, durable, soft canvas upper. SIZE: Ballet shoe sizing is different from street shoe sizing. Please measure the length of bare feet and be sure to take a moment to measure your kid' feet to make sure the dance shoes fitness. 20 years of professional dance / ballet shoe production experience, providing young students with introductory ballet shoes. Crafted from high quality, lightweight, soft, durable leather and cotton lining, striped elastics for a variety of indoor dance, yoga, ballroom and family versatile shoes. Refer to the shoe size chart in images for proper sizing. Matie Fix dance shoes made of Superior adjustable elastic cord. They are lightweight, super soft, durable comfortable dance shoes. Great for ballet, dancing, gymnastics, performance,yoga, class show etc. Thicken spinning and encryption shoes uppers, Elastic adrustable cord design make feet feel comfy and will not hurt. 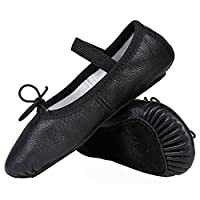 Absorb sweat, strong permeability fully lined make feet feel breathable and comfortable when dancing.Besides, Leather soles can prevent you from slipping. 100% Quality Guarantee. Please kindly check and choose your correct size. And we offer no reason return and refund policy if and problem. Please feel free to contact our friendly and professional customer service team in any time. Vamp Material :canvas ; The sole material : Wear non-slip leather. Elastic band more flexible, fit body mechanics, more income feet and flexible. Cotton lining lining, increased sweat, which also makes the shoe more comfortable. Cotton insoles to improve the comfort of the shoes, softness, avoid rigid insole foot injury, foot better care. Notice: Do not machine wash, Do not exposure. HIGH QUALITY : Soft and durable Canvas upper,leather sole,make feet feel breathable and comfortable! ELASTIC CORD: With elastic cord,dancing slippers' uppers can be adjusted tight and loose after twitching elastic cord firmly and will not hurt the feet. ANTI-SLIP SOLE: Leather sole prevent you from slipping. SATISFACTION & GUARANTEE: Our ballet Dance Shoes 100% Quality Guarantee. We Promise 30 Days Return Policy And Engages in problem solving. The slippers feature a suede sole patch and elastic drawstrings. The elastics are pre-attached at the heel. They are slightly small, please measure your foot length for safety and get the best fit. Dance in Baiwu Women's Canvas Split Sole Dance Slipper. Slipper features a split sole with elastic criss cross strap. Perfect for any stage performance. STORAGE - The spacious compartment is ideal for storing your little ones dance clothes or shoes so she's ready to go. A back wall zip pocket is great for storing a phone or small wallet. DETAIL - The front quilted design features embroidered dance slippers with rhinestone accents and a polka dot bow. TO GO - The versatile design can be taken with you no matter where you go. Head to the store, mall, or dance practice with all your daily essentials. Size chart: Size XXS (Age:2t), Size XS (Age: 3t), Size S (Age: 4t), Size M(Age: 5-6t), Size L(Age: 7-8t); Size chart is recommended based on our measurements and past customers' reviews.